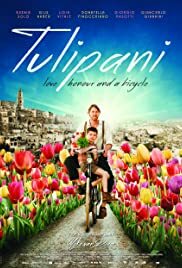 If the title of the new Dutch, Canadian and Italian co-production TULIPANI – LOVE, HONOUR AND A BICYCLE (written by Dutch-Canadian writer Peter Van Wijk) sounds whimsical, it is appropriate – for the film is a whimsical tall-tale of romance and comedy. 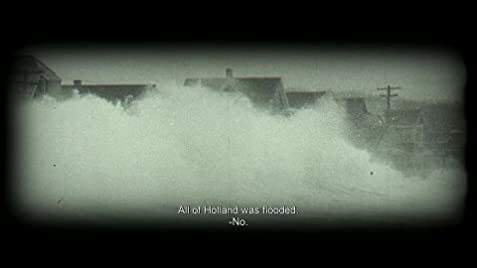 The film begins with the Dutch catastrophic flood of 1953 where farmers lost their lands. Gauke (Gijs Naber), a one of hose unfortunate Dutch farmers. He vows he will never have wet feet again. Armed with a satchel full of tulips bulbs, he cycles south, where fate leads him to the sweltering heat of Italy, and he settles (after collapsing on his bike) on the outskirts of a small village in Puglia. Against all odds, he plies his fairylike and miraculous tulip trade, lives his passionate love-life. The film alternates between the present and the past. The present sees Italian inspector (Giancarlo Giannini) questioning three suspects that includes Anna (Ksenia Solo) on a murder. Anna relate the story oh how she had left Montreal, Canada after her mother dies in hospital to disperse of her ashes in Italy. Her story is the film’s story. The film goes back to where Anna first goes back to Puglia, Italy where she meets Vito and his mother. The mother is the one who took Gauke in. The tale goes on to how the Dutchman helps the village stand up against the local Mafia. TULIPANI is a beautifully shot film, a sort of fairy tale that does not necessarily have a happy ending. But it has a message of standing up against oppressors. The fact that Gauke sells hundreds of tulips to every single one of the villagers who have them displayed on their windows is quite the fairy tale. The story involves all three countries, the Netherlands, Italy and Canada with the most respect given to Dutch culture and the love of tulips. The Italians are portrayed as loud-mouthed feisty people but the film shows the beauty of Italy. One has to take some of the scenes in stride. The audience is to believe that all the tulips sprout up one day in multiple colours to the delight of the Italians which no one notices the day before. The excuse given however, is that the story as told by Anna to the inspector is exaggerated, At one point, the inspector claims that he loves a good story, implying the director Van Diem giving himself a pat on the shoulder for being a good story teller.